Our modern understanding of the nature of the atom stems from experiments done with particle accelerators. But behind every particle accelerator, there’s a power source. This discharge is much like a bolt of lightning. And, like lightning, it packs a huge punch. The power of a Van de Graaff generator can hurl atomic particles – – such as electrons, protons, or atomic nuclei — through a chamber at high speed. Thus the Van de Graaff generator — when used in particle accelerators — has helped reveal the parts of atoms — and thereby the underlying structure of the physical universe. It’s said that Van de Graaff got the idea for his generator while still a student — while watching sparks fly from a printing press. Variations of the generator are still in use today in laboratories around the world. Our thanks today to the Research Corporation — since 1912, a foundation for basic scientific research. The first large Van de Graaff generator, constructed in a blimp hangar at Round Hill, Mass. Photo, taken in 1933, courtesy Research Corporation. The first large Van de Graaff generator, constructed in a blimp hangar at Round Hill, Mass. Photos, taken in 1933, courtesy Research Corporation. Dr. Robert J. Van de Graaff. Photo courtesy Research Corporation. 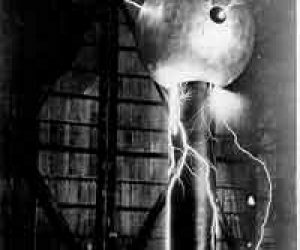 A Van de Graaff generator is a device to make very high voltages. It works by generating static electricity, just as when you shuffle your feet on a rug and then touch a doorknob. For this generator, the belts look just like large car fan belts, and they are engineered to do this “footshuffling” very efficiently. Thus you can get very large voltages and very large sparks or, you can use the voltages to accelerate other charged particles, like atomic nucleii. Van de Graaff’s device is a type of electrostatic generator. It builds up an electrical charge on two metal spheres — which can then be used to power a particle accelerator or high energy x-ray machines. Lower powered versions can make your hair stand on end in much the same way that rubbing your feet on carpet can, on a cold, dry day. Some work on the electrostatic generator was sponsored by Research Corporation in 1931. In fact, Research Corporation awarded numerous grants to Van de Graaff from 1931 to 1941. 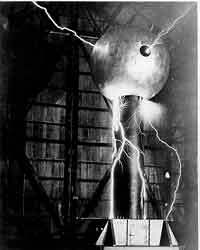 In 1933, with the aid of Research Corporation funds, Van de Graaff built and demonstrated the first large Van de Graaff generator. It was so large that it had to be housed in a blimp hangar at Round Hill, Massachusetts. The spheres of this generator were each 15 feet 5 meters in diameter. The device “provided 20 times the output of any machine then known. It became the heart of one of the first powerful particle accelerators for probing matter.” Research Corporation Quarterly Bulletin, pg. 3 But it didn’t operate as well as hoped in open air and was later reconstructed in a pressurized chamber at MIT. 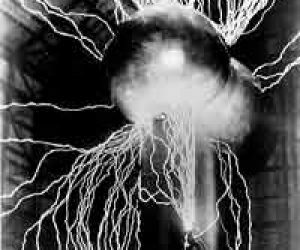 Van de Graaff patented his electrostatic generator in 1935. Van de Graaff Dec. 20, 1901 – Jan. 16, 1967 received his M.S. degree in mechanical engineering from the University of Alabama in 1923 and his Ph.D. in physics from Oxford University Queen’s College in 1928. He was a Rhodes scholar. 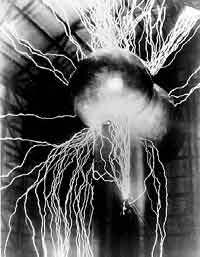 He returned to the United States in 1929 and began his serious research into electrostatic generators in 1931. 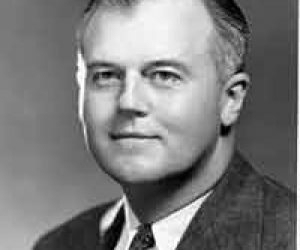 In the 1930s and 1940s, Van de Graaff developed medical x-ray machines and x-ray machines for testing naval ordnance — both based on his patented generator. 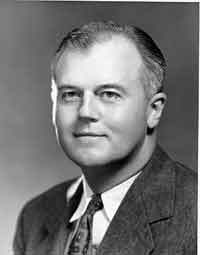 From 1934 to 1960, Van de Graaff was an associate professor of physics at MIT. In the 15 years following World War II, he was chief physicist for HVEC High Voltage Engineering Corporation, which manufactured commercial Van de Graaff generators as X-ray machines and particle accelerators.